Thank you to all those that placed an ad - this deadline has closed. All food and beverages consumed on the premises must solely be provided by Amway Grand Plaza Catering or Concessions. All tickets are $10 per person; children under 10 years or less are $5 each. Tickets will be available for sale 1 hour prior to the performance at the performance venue. Purchase tickets online at Ticketmaster or at the DeVos Place Box Office. 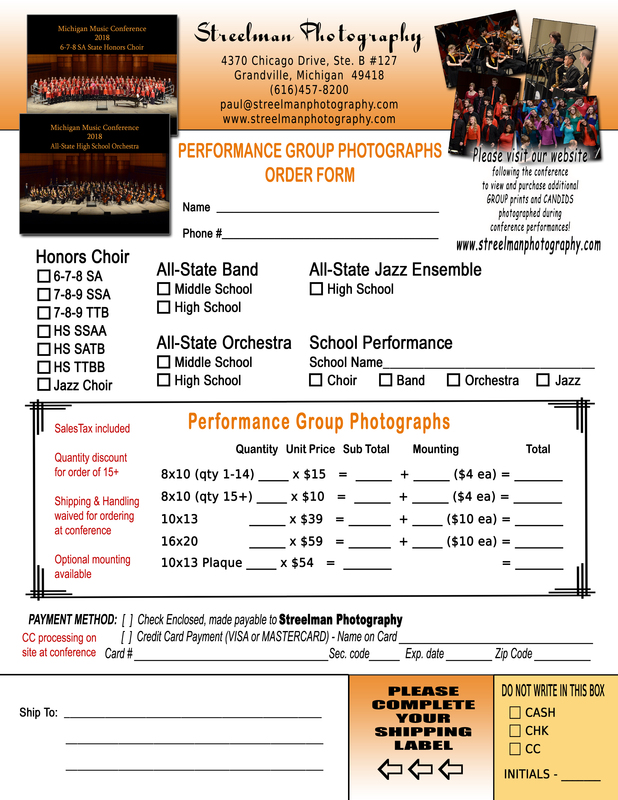 Streelman Photography will be taking pictures throughout the Conference, including each All State Bands & Orchestras performance group. There will be a desk in Secchia Hall, just outside the exhibit trade show entrance where you can order photographs directly and a link will be provided on the MMC website shortly after the conference ends. Soundwaves Recording will be recoding performances throughout the Conference. CDs and DVDs will be available to purchase. Featured performances include Band, Orchestra, Choir, Jazz, Honors Composition Concert, Thursday Evening Concert and All-State Performance. Visit the Soundwaves booth in the Exhibit Hall.